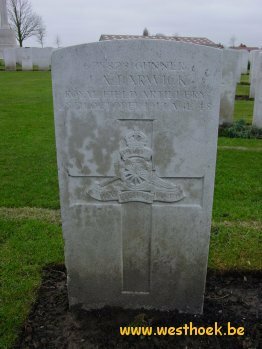 Gunner JOHN ARTHUR BARWICK 675828 "A" Bty. 285th Bde., Royal Field Artillery who died on Thursday 25 October 1917. Age 48. Gunner JOHN ARTHUR BARWICK 675828 "A" Bty. 285th Bde., Royal Field Artillery who died on Thursday 25 October 1917. Age 48. Son of John and Hannah Barwick, of Bridgeport, U.S.A.; husband of Minnie Barwick, of 54th Avenue East, South Vancouver, British Columbia. Native of Heaton, Bradford, England. Oldest casualty on CEMENT HOUSE CEMETERY Grave III. C. 1.